Antarctic Days Sketches of the homely side of Polar life... introduced by Sir Ernest Shackleton. London: Butler & Tanner for Andrew Melrose, 1913. 4° (254 x 190mm). 4 mounted coloured plates, 33 black and white plates, illustrations, after Marston, Murray, Sir Philip Brocklehurst and others. Original light blue cloth gilt, coloured plate mounted on upper cover, t.e.g. (light discolouration to spine and upper cover). Rare. Edition de luxe, limited to 280 copies, this number 219. 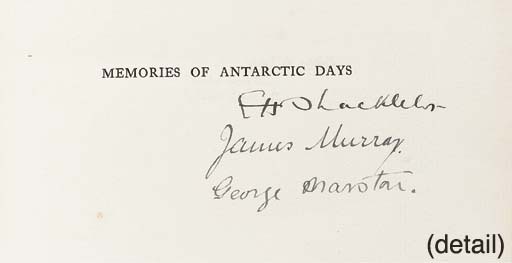 Signed by Murray, Marston and Shackleton on half-title. Conrad p.145; Spence 830; Taurus 61.